Spray Falls might be one of the most dramatic waterfalls that flows into Lake Superior. 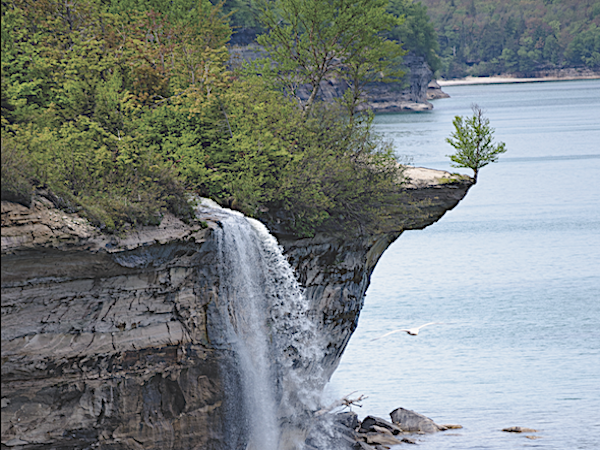 Greg Kretovic, author of Waterfalls of Michigan, takes us on a visit. Situated along Lake Superior and the towering sandstone cliffs of Pictured Rocks, this falls is a sheer drop into the big lake and a very impressive sight! Spray Falls is unique in that you can enjoy it from land or on the water. 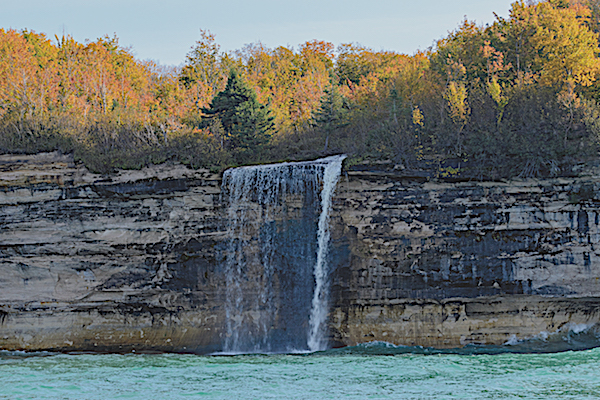 The fastest and easiest way to see the falls is from the water, taking the Pictured Rocks Cruise. They offer a special Spray Falls cruise that goes farther up the shoreline to see this falls. You also have the option to rent a pontoon boat from local outfitters and navigate the lake yourself to see the falls. Viewing it by land requires a lengthy hike, but it’s well worth the effort. Along the hike to the falls, you’ll pass some great scenery, including views of the Lake Superior shoreline, with its unique sandstone rock formations. After parking near Little Beaver Lake Campground, you’ll first have to hike to the shoreline for 1.4 miles. Parts of this section can be muddy, and there are some small hills. Once you reach the shoreline, head west on the Lakeshore Trail, which is also part of the North Country Trail. The terrain starts off relatively flat but then becomes more hilly as the cliffs rise above Lake Superior. After 2.3 miles, you’ll see a small sign noting Spray Falls and a trail leading to the right. This short side trail leads you to an amazing clearing along Pictured Rocks that is also high above the water. 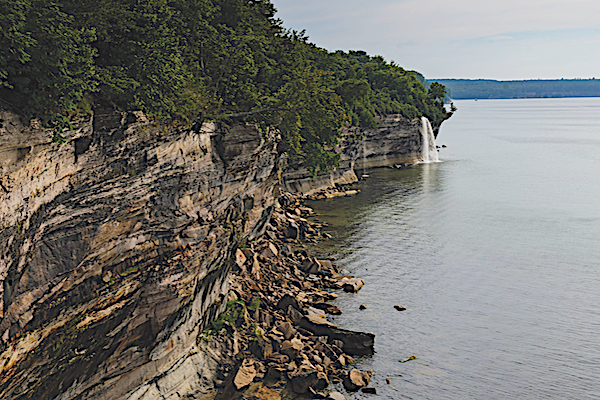 From here, you can see Spray Falls (about 300+ yards away) and the rest of the impressive shoreline. Note: There are no barriers or fences along the trails, so make sure to watch your footing and keep small children away from the edge. For more stories about amazing waterfalls, sign up for our newsletter now!